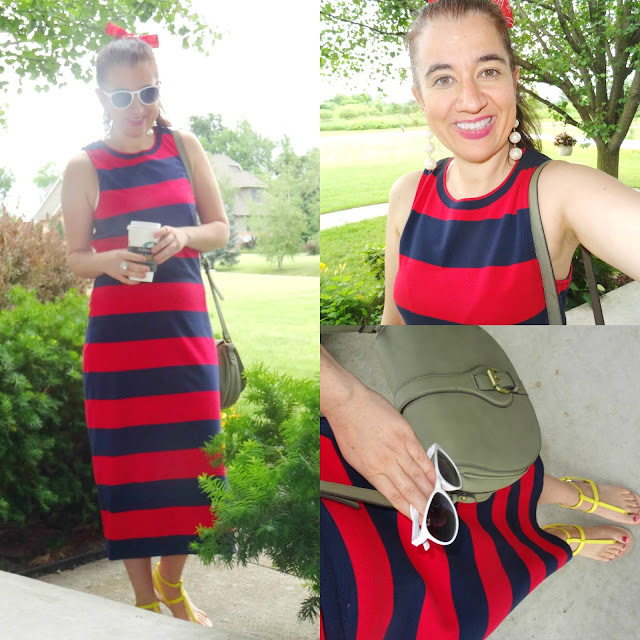 The Sunday Showcase Linkup, July 2018 - Independence Day. I cannot believe it is already July and 2018 is half-way over. WOW!! So hard to believe. As much as I hate that time goes by so fast and our children grow up fast too, 2018 has been a year of ups and downs and challenges for me and some of the past months haven't been the greatest but June was wonderful for the most part. I conquered something big and I also got a new car, among other things. Vivian also started Summer school which she loves (she goes part-time). 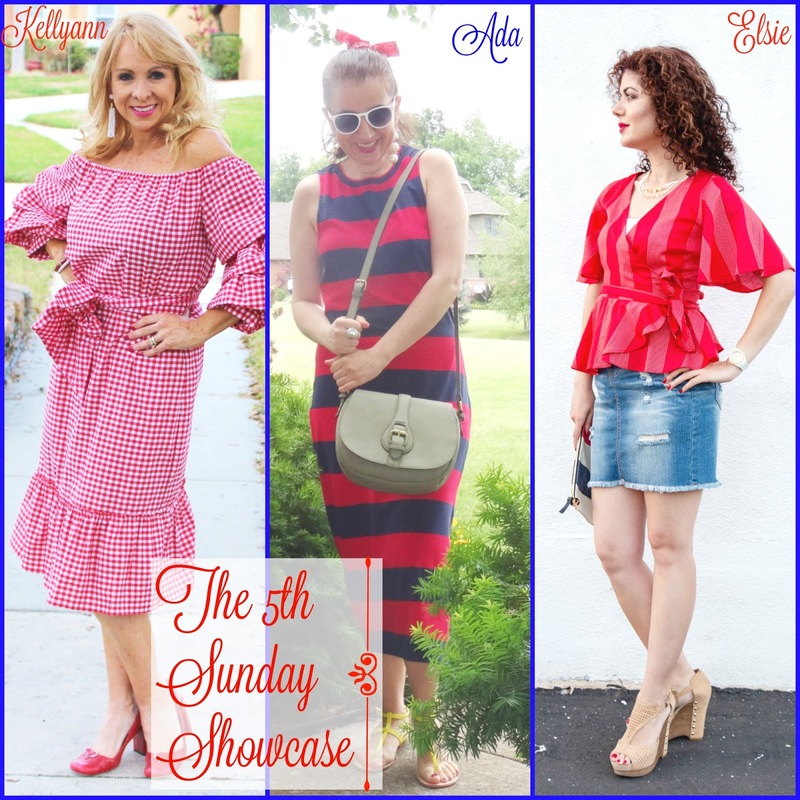 For this month's Sunday Showcase Linkup which I host with KELLYANN from This Blonde's Shopping Bag and CHRISSY from Granola and Grace we have a co-host, ELSIE from Polished Whimsy who is a mom to a little girl and a working professional. She is also a skirt-lover as is evident by today's outfit too, love her denim mini skirt. Speaking of skirts, stay tuned for the week of July 9th because Elsie and I are doing a collaboration featuring different style of skirts, every day next week! And, those tall wedges, Elsie has on - stunning! As you will notice from our outfits on the collage above, today's outfits have a theme and that is "Independence Day"/4th of July as it is only 3 days away. Gorgeous Kellyann is rocking that Gingham Red OTS again, the one she also wore for another one of our collabs. 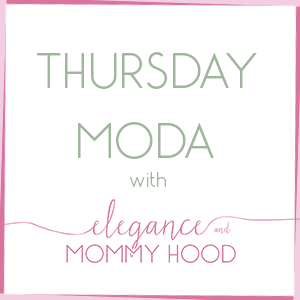 I love that Kellyann's and Elsie's outfits are both a little dressy and fancy, while mine is casual but still very put-together, colorful and fun.You can read Elsie's post in full, here - lots of good stuff to read there. And I missed out on the pretty red striped wrap blouse from Loft that Elsie so beautifully styled today. 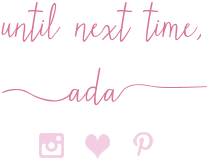 Our friend Chrissy just moved with her family to a different state so she couldn't be a part of today's Sunday Showcase but you can read about her latest adventures here. Last but not least here is Kellyann. First, I wanted to include Vivian in today's post too, where we both styled a Red+White+Blue Independence Day Outfit but between my crazy work schedule and her school, we haven't been able to wear or shoot our matchy Mommy+Me Outfits but we will shoot one or two today! So, instead you get this outfit I wore last week on a Friday off where we also went to Starbucks. It is totally a mom look, but what I'd call a "Mom Babe Outfit" for sure. I am casual, comfortable yet so put-together. Let me sing praises to this dress too. It is probably my most favorite dress I purchased this year. 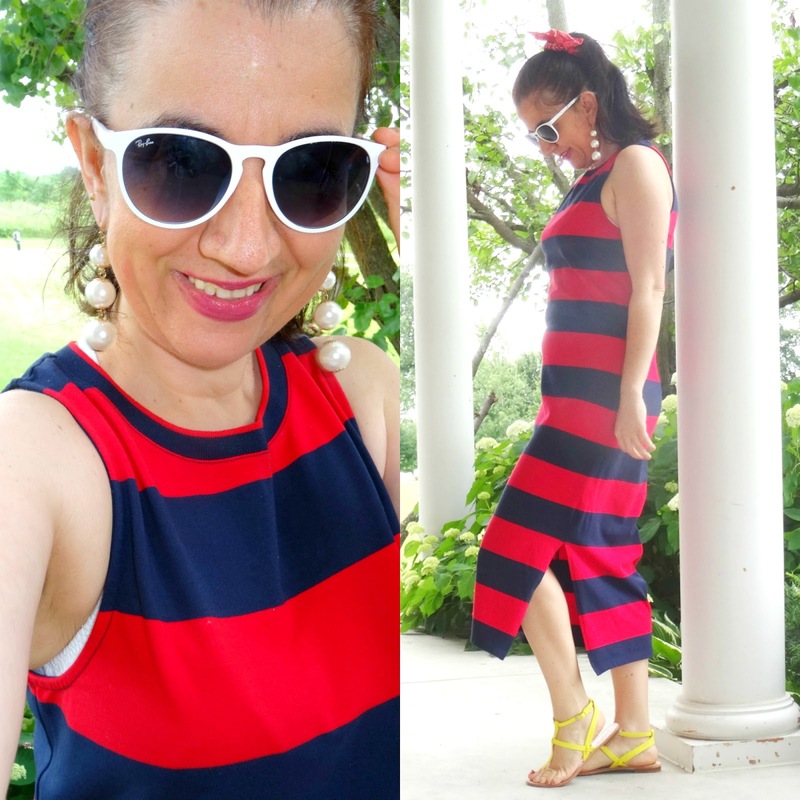 It is a very breathable cotton knit, I love the midi length, the simple style and of course the vibrant navy+red. It is perfect for July 4th. It is by Target's A New Day line and retails for $27.99 but I got it when they were doing a BOGO 50 % OFF on their dresses. It is totally worth every penny of its full price though and I would even pay more for it. I styled it with that pretty Rosie Riveter Red+White Patterned Ponytail Bow Elastic which you also saw on this work-chic 4th of July Thursday Moda post. 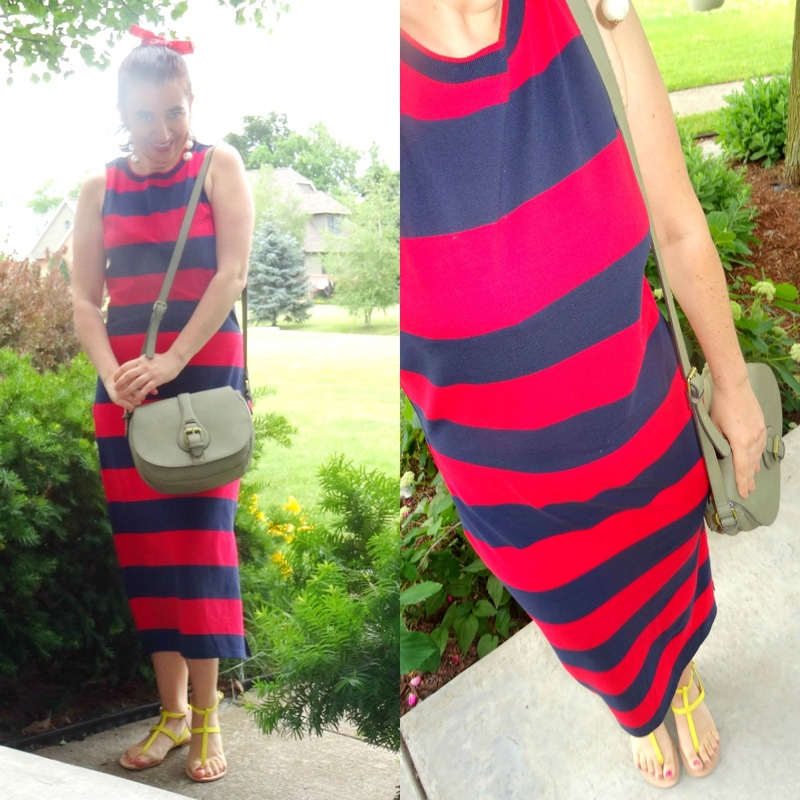 I wore stripes and mostly red and navy in that outfit, too. I definitely think that fun red bow holder is perfect for Independence Day and all through Summer. But I love that I added more pops of color to my outfit so I chose Vibrant Yellow Thing Sandals (on huge clearance last Summer from Loft) and my Olive Green Saddle Crossbody Bag by Target (I have had for a couple of years). The white in this outfit comes through my RayBan Sunglasses and the Large Pearl Statement Earrings by Francesca's. Funny thing about this great dress, is that literally a few days after I had purchased it and worn it for the first time, a co-worker of mine walks in to work wearing this dress. And I complimented her on it of course and how she had styled it. I told her I owned it too lol. Which makes me more excited that next time wear this dress, I will totally dress it up, probably for work too. But I have already worn it twice guys and I will probably wear it again these next couple of days, probably with some white sandals. 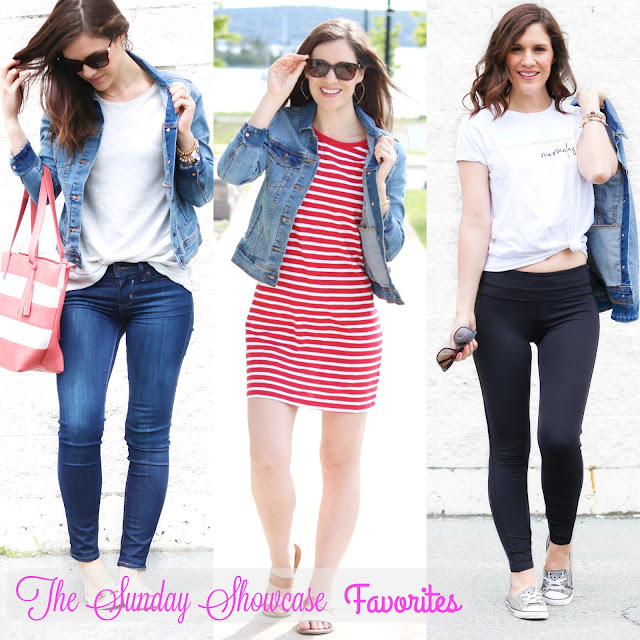 Below is a collage of the three favorite outfits from June's Sunday Showcase. All three outfits were part of the same post that Katrina Gwen Rose linked up with us. Katrina Gwen does casual outfits so well, always. And I was totally in love with this post where she styled a Denim Jacket three ways because all three outfits are totally perfect for upcoming 4th of July too and all are totally Americana. After all a denim jacket is a closet staple in an American woman's wardrobe. It is that casual piece that can be dressed up too. It is the kind of jacket that goes with anything and looks great over everything. As a matter of fact last Spring in 2017, I too styled my Red+White Striped Dress like Katrina Gwen with my Denim Jacket and some Neutral Sneakers.